Most people who actually grew up in Portland and weren’t just lured here from California by the promise of cheap housing will tell you that the city just isn’t what it used to be. They’ll reminisce about bars that used to be cool until the hipsters took over, neighborhoods that were affordable before they were gentrified, and delicious restaurants where you used to be able to walk right in and get a table. Well, all of it is true but that doesn’t mean that Portland isn’t still awesome. I grew up in a house that was built by my great grandfather, Axel Anderson, back in the early 1900s. It’s in North Portland, on Sumner street, just a block and a half from the Adidas campus. But at the time that I grew up there, it was one of the least desirable neighborhoods in the city. Where Adidas sits now was actually Kaiser Hospital and it was sliding down a hill. I couldn’t convince my friends to come for a sleepover at my house. My mom had to write letters to get me into the public schools in the more upscale neighborhoods further east. So yeah, Portland has changed a lot. And housing prices have gotten significantly more expensive. But that’s because Portland has continued to become a more desirable place to live. And with that has come more delicious restaurants and better breweries and larger weekend markets and it is now actually considered an appealing travel destination! 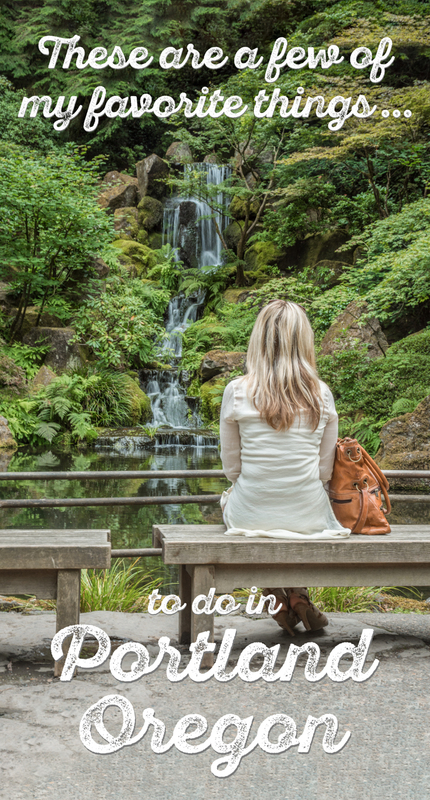 So if you are one of the many others planning a big move to the west coast, or even just a visit, check out a few of the best things to do in Portland from a local expert! Portland has some cool boutique hotels so if you’re coming to the City of Roses make sure you check out these 10 cool hotels in Portland. Check out our list of packing essentials for your trip to Portland here! If you wake up on a Saturday or Sunday around 10am, starving, maybe even slightly hungover and want to grab a bite to eat, you must first ask yourself how long you are willing to wait. If you are a 10 on a hunger scale of 1-10 you should probably head to the grocery store instead of a restaurant and get yourself some cereal. Because depending on the popularity scale of the restaurant you choose, you could be waiting upwards of 2 hours for a table. Even breakfast food trucks generally have an hour long wait for their “fast” food. On weekends, starting at 9am, locals and tourists alike descend on the popular brunch spots around the city to create their own Bloody Mary bar concoctions or sip bottomless mimosas while waiting for their fancy pancakes to arrive. Gravy – located in North Portland on the hip but still quaint Mississippi Street, you’ll probably have a difficult time spotting the sign for Gravy but will most definitely see the hordes of hungry people waiting outside. Known for their delicious gravy options (shocker, I know) and their creme brulee oatmeal this is arguably the most popular brunch spot in Portland. Go either really early or near closing time for the shortest line. Radio Room – offering a build-your-own Bloody Mary bar with over 80 hot sauce options, what more could you ask for? They also have delicious classic brunch options, cozy fire pits, and a fun atmosphere. There’s rarely a wait for a table. Genies Cafe – located on SE Division, Genies resembles an old school diner. They use local cage free eggs and farm raised meats in their delicious traditional breakfast dishes. There’s usually a wait but you can nab one of the best Bloody Marys in town at the bar to keep yourself entertained. Screen Door – offering Southern home cooking, Screen Door is one of the most popular restaurants in Portland both for brunch AND for dinner (it’s rare to do both so phenomenally). Don’t even think about not ordering the fried chicken and waffles, you’ll regret it. You’ll definitely be in for a wait and the line starts even before they open. Not in the mood for brunch? Check out this Portland Food Guide for some more great dining recommendations! Portland prides itself on being incredibly pedestrian-friendly. 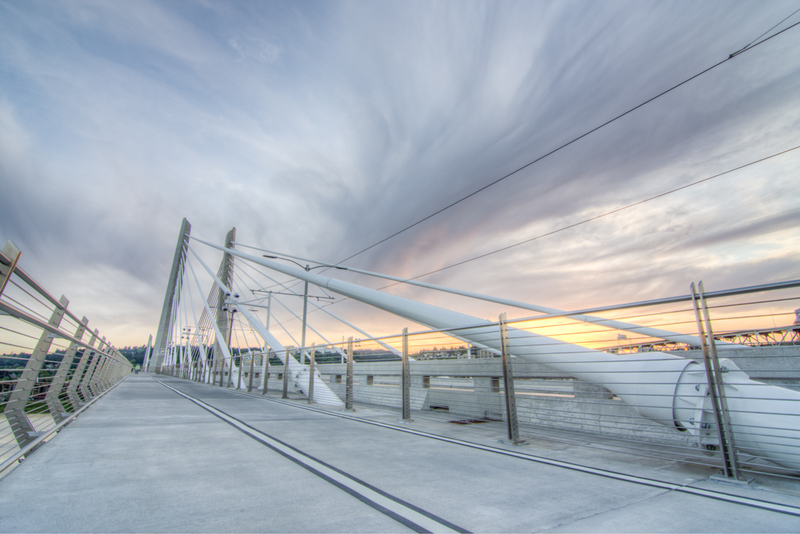 It’s newest landmark a the no-cars-allowed “bridge of the people”; the Tilikum Crossing. Pedestrians ALWAYS have the right-of-way in Portland so if you find yourself behind the wheel be sure to exercise caution. Driving is actually one of the least desirable things to do in the city as the bike lanes and MAX lines have essentially taken over the streets. Ditch the 4 wheels and opt for either a set of 2 or your own two feet for an urban biking or walking tour. The downtown waterfront is a perfect place for Willamette River views and offers the most interesting people watching around. A popular spot for joggers, business people taking a lunchtime stroll, and homeless kids doing drug deals – you’ll find all walks of life on the southwest waterfront. Cross any one of the numerous bridges to the east side of the river which is far less populated to make your trip a loop. Stop for a coffee at one of the cute restaurants popping up on the up-and-coming south waterfront area before making your way back back to the hustle and bustle of the city. After your tour of the waterfront, head west on Broadway street toward the Pearl district. Take a right on 10th street to pop into Powell’s, the famous and massive used bookstore. After checking out the cute little shops of the Pearl, keep heading west to NW 23rd street for more quaint shops and delectable restaurants. International Rose Test Garden – take a stroll along the paved trail through the garden to marvel at the hundreds of rose varietals being tended to with loving care. Don’t forget to stop every now again to smell the roses! 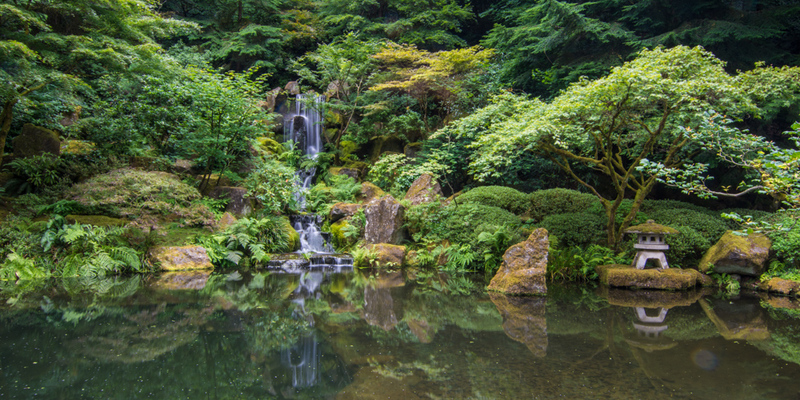 Japanese Gardens – just across the road from the Rose Garden you’ll find the tranquil Japanese Gardens. It’s the perfect place to sit in the shade by a bubbling fountain to ponder the meaning of life. Forest Park – not many large cities offer massive parks smack dab in the city center, complete with a 40-mile loop system catering to pedestrians. 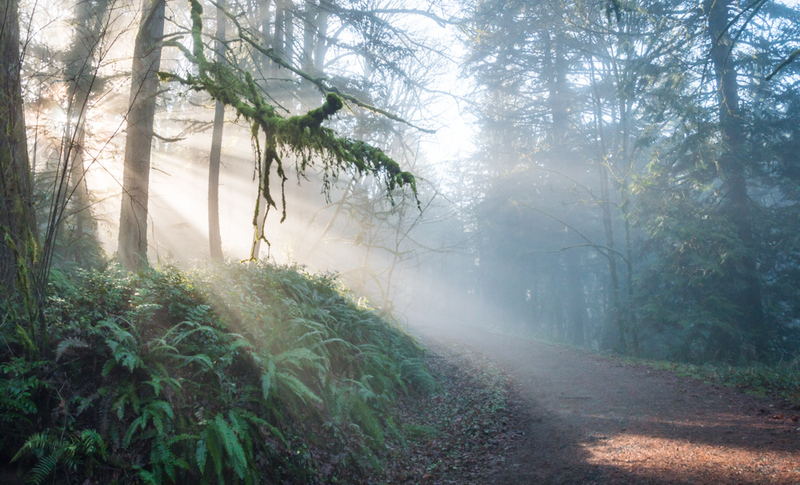 Try our favorite hike– start at the Lower Macleay Park Trailhead and end at the Pittock Mansion for epic city views (and a tour of the mansion if you’re up for it). The Columbia River creates a natural border between Oregon and Washington. If you don’t have a car, you’ll need to rent one for this. Start cruising up I-84 towards Multnomah Falls. Just the view of the river from your car window is absolutely breathtaking. Multnomah-Wahkeena Loop Hike – this moderate, 5-mile hike begins and ends at Multnomah Falls (a must-see in Oregon!) that gets you out of the crowds and into nature. You’ll pass by 8 waterfalls along this beautiful hike. It’s where we take our out-of-town friends! Beacon Rock – is a short, 1.8 mile round-trip, steep hike on the Washington side of the gorge that is an easy way to get epic views without too much time or effort. It’s paved and there are stairs that climb up the steepest parts so it’s okay for the whole family. 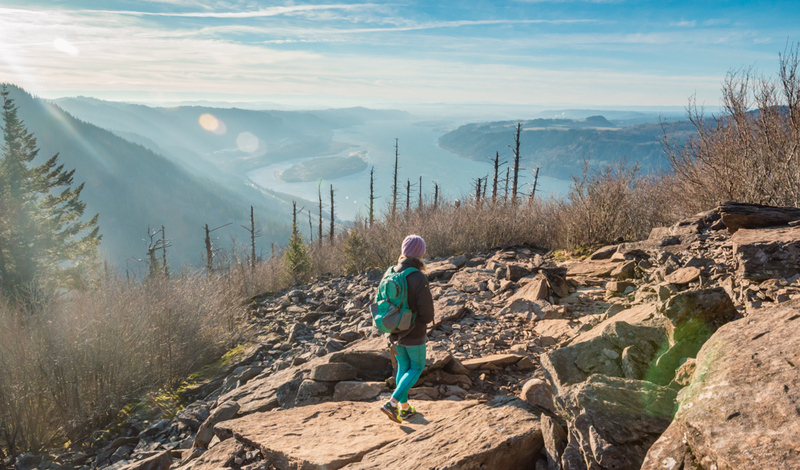 Angels Rest – this moderate, 4.8 miles out-and-back hike offers love flora and fauna along the well-beaten trail and a spectacular viewpoint at the end. Dog Mountain – the best time to do this moderate 6.9 mile hike is when the wildflowers are blooming in the spring. Check the wildflower report before you go. 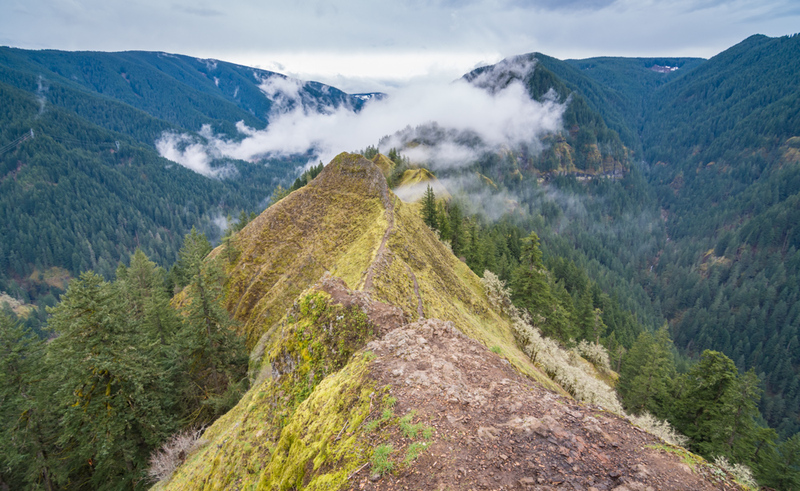 Munra Point – this is a very strenuous 6-mile hike and not recommended for little ones. The last half mile or so is a steep uphill scramble to the lookout. You’ll be sweating like crazy once you reach the top and then you’ll need to walk across a narrow trail with drop-offs on each side to the lookout point. Once you do you’ll be rewarded with epic views of the gorge below. I’ll start with this little gem – did you know that Oregon doesn’t have sales tax? Yep, that’s right – the price you see is the price you pay. Folks in bordering states often make the trip for large purchases to save themselves heaps of cash. So be sure to stock up on the goods while you’re in town! Portland is filled to the brim with darling and unique shops featuring locally made goods. You’ll find all kinds of different shops in every little neighborhood of Portland. You’ll find upscale shops and art galleries in the Pearl and NW 23rd area and funky clothing and accessory shops along Alberta, Mississippi and Williams across the river. Portland is also known for artisan and farmers markets all over town. There are three big markets that happen monthly so depending on the timing of your visit you should attempt to hit at least one! Alberta Street Fair – takes place on the last Thursday of every month (except in the cold winter months). It’s an eclectic mix of street performers, live music, artwork, and outdoor cafes perfect for watching the spectacle of misfits wander past. First Thursday – takes place on the first Thursday of every month (except in the cold winter months). It’s a classy affair with art galleries touting wine tastes and snacks and a few streets taken over by local artisans selling their wares. Saturday Market – a little confusing but this market is actually open on Saturdays AND Sundays. It’s the largest one in Portland – consuming a giant area along Naito Parkway on the waterfront. You can spend hours wandering through the maze of artisan shops. They also offer a large selection of food trucks and live music on the main stage. Fun fact about Portland – it has more strip clubs per capita and more microbreweries than anywhere else in the world! The booming craft beer scene was actually one of the things that originally put Portland on the map as an up and coming travel destination (perhaps the amount of strip clubs had something to do with it as well). It rains approximately 100 days of the year in Portland so day-drinking is a popular hobby for native Portlanders.But with so many options, finding your day-drinking destination can be a paralyzing decision. We’ve tried nearly all of them (for research purposes of course) so you don’t have to. 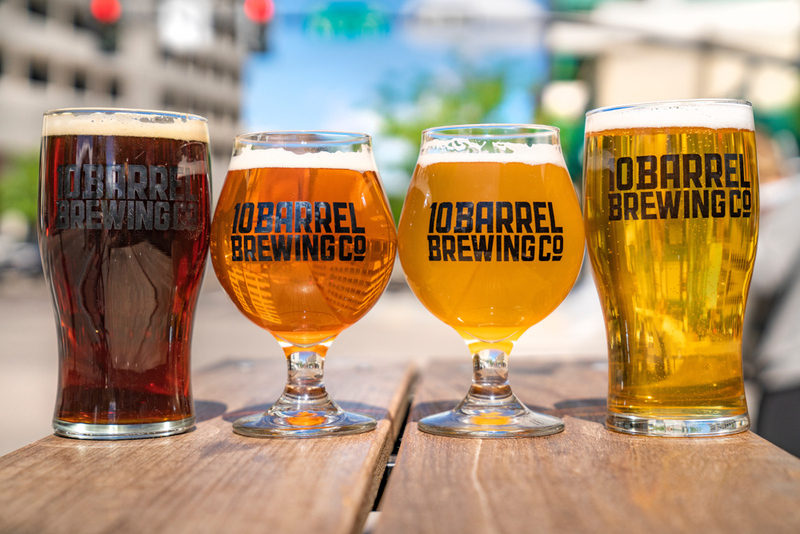 10 Barrel Brewing – this would likely be disputed by many Oregonians because 10 Barrel was once a small brewery and has since been purchased by Anheuser-Busch (boooo big corporations!). But the beer is tasty and their rooftop patio is one of our favorite spots to spend a sunny Saturday afternoon. Keep in mind that if you want an actual table you could have to wait for several hours. Opt for standing room only space and eat dinner elsewhere. Hopworks Urban Brewery (HUB) – sustainability and community involvement are high on the list of priorities at this local hot spot. Check out their Williams Ave location during happy hour! Breakside Brewery – their NW Portland location has a huge and lively tasting room, perfect for meeting new friends! Plus they offer big portions of pub classics. Basecamp Brewing – Basecamp offers tasty beers and they often host events in their large outdoor space. Check the “events” page on their website to stay up-to-date! 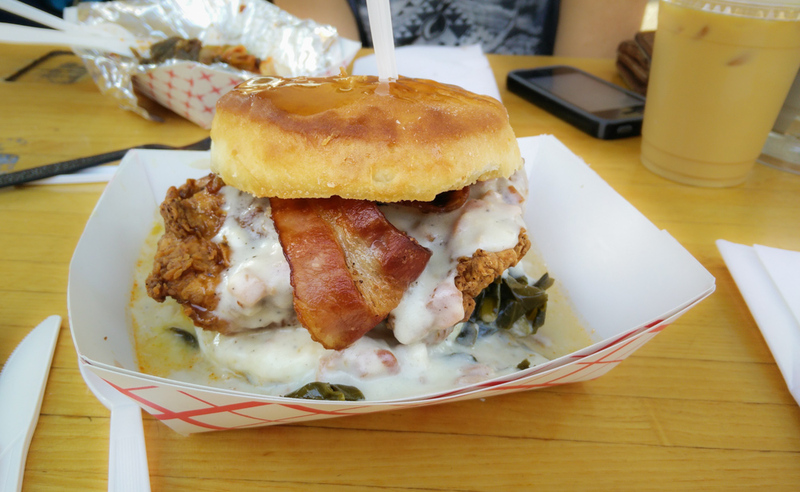 Tilt – this is probably our favorite food spot in all of Portland. Giant portions of delectable sandwiches and salads at super reasonable prices. They also have a large and rotating beer and wine selection. Our fave location is in the Pearl. The Alibi – a Portland institution. It’s a tiki-themed karaoke bar that it always busy on Friday and Saturday nights. If you actually want to sing karaoke you’ll need to get your request in before 9pm or toss the DJ some cash. Tin Bucket – small bottle shops have been popping up all over town but Tin Bucket is by far our fave. Located on Williams Street in North Portland, they have a giant beer selection with super cheap prices. No food served here but they’ll let you bring in whatever you’d like if you want a snack. Saucebox – one of our all-time-favorite happy hour spots in SW Portland. The food is unreal and so cheap! Uno Mas – this is the gathering place for Timbers fans before and after games due to it’s delicious margaritas and close proximity to the stadium. If you can’t get tickets to a game – no fear! Hang at Uno Mas as they’ve got plenty of televisions and $1 taco specials. Century Bar – with stadium-style seating and lots of tvs, this is the perfect sports bar to catch a game! I’d like to think that the food truck scene originated in Portland. It didn’t. According to The New York Times Magazine the first food truck was in 1872 in Rhode Island when a man cut windows into a small covered wagon and sold sandwiches and coffee to businessmen working late. They really took off in LA in in 2008 but Portland has taken the craze and run with it. We even have food trucks in our International Airport (which is one of the best airports in the world by the way…). 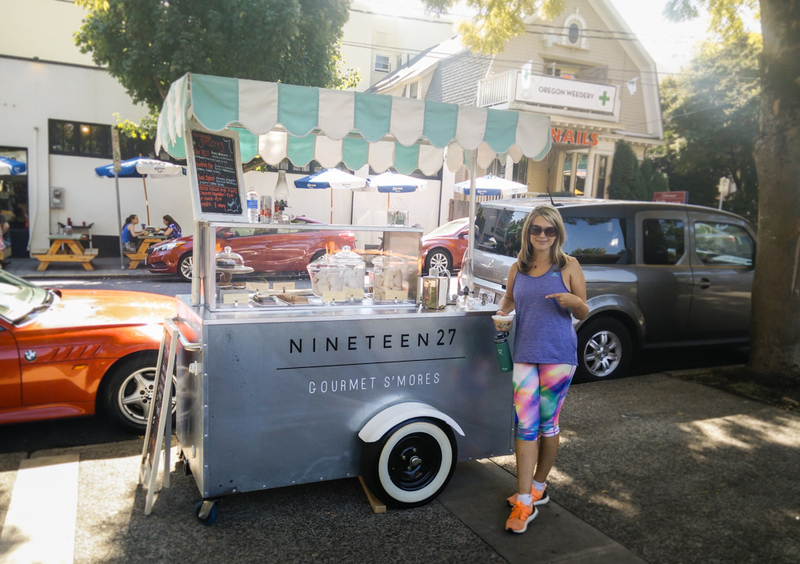 You’ll see food trucks all over the place in Portland. They have taken over several full downtown city blocks. You can find everything from cheese steak sandwiches to gyros to burritos to curries and everything else your heart could desire. You’ve only got so much stomach space so stick to our faves to ensure you try the best the city has to offer. Grilled Cheese Grill – who doesn’t love a grilled cheese? What about “The Cheesus”? It’s like a traditional cheeseburger but the meat is sandwiched between two grilled cheeses instead of a bun and it’s insane. They have two locations but our fave is the school bus located on 11th and Alberta. My go-to choice is the Jalapeno Popper with tomato soup! Potato Champion – if you like poutine fries you will go gaga over this place. It’s perfect for a late night snack after hitting the bar scene around town. Koi Fusion – love Mexican food? Love Korean food? Why not mix ’em! Koi Fusion has been around for a long time and have a ton of locations but keep in mind that if food trucks aren’t keeping their menu and their food on-point, they don’t last long. So staying power means they’re doing something right. Try their take on the classic cheesesteak with Bolgogi beef and Kimchi! Movie prices have gotten a wee bit out of control these days. Luckily Portland has a fantastic second-run movie theater scene – the movies they show have already been out for a few months and the theaters aren’t as posh but they are generally half the price. They also sell reasonably priced beer, wine, and snacks so you can have a fun outing with the family without breaking the bank. Sometimes you can even catch a cult classic movie screening (like Rocky Horror Picture Show) where fans dress up and shout out their favorite lines – it’s wildly entertaining. And lastly, if you have time… check out a Timbers soccer game, eat a donut (at Blue Star if you are looking for an amazing selection of tasty deliciousness, or Voodoo if you want to wait in line for an hour), and help us to KEEP PORTLAND WEIRD!!! Great summary! Portland is on my list, and I’d definitely like to see the city then use it as a base to explore the hiking trails. The scenery looks epic! The hiking in Oregon is pretty amazing for sure. Hope you get to visit soon! The Alberta Market seems amazing. There is a Feng Sui about periodic events. Once moth, excluding winter, seems like it happens enough to be well practiced and infrequent enough to retain an air of mystery and excitement. Yes, that particular market is pretty eclectic. Last time we went there were fire dancers and lots of strange costumes, lol. It’s perfect for people-watching! The more time we spend Blogging, the more we want to go to the US. You made me want to go to Portland now as well 😀 I’m so inreagued to see all the Microbreweries (for scientific reasons of course) and eat me through all the Food trucks (for biologic reasons)! Especially the Cheesus … OMG, I Need to try him! I feel like Rick and his quest for the Szechuan Sauce 😀 Thank you for this cool article! Portland is definitely a must-see for us! We love seeking out the booze scene in different destinations, so the breweries there are calling our name! But you got me even more intrigued with the brunches! I think we would have to check out Genies and Salty’s for sure!! Yeah! I hope you make it over for a visit soon! Brewfest happens one weekend every summer and might be the perfect time for your visit! Ooooo we did a US road trip and absolutely loved it! You’ll have a BLAST! What a great list of brunch places. I can’t wait to check them out. The Tilikum Crossing bridge looks cool. Love the downtown food trucks. Brunch is a MUST in Portland! If you find any other hidden gems please let us know! Agreed on all points! And yes, with beaches, deserts, mountains, and waterfalls nearby you really can’t beat the location! Great detailed guide you have there! I’ve friends who went to school there and it sounded a beautiful town! I’d love to try those brunch options you mentioned. The little gems and markets you mentioned also sound really interesting. Love exploring little shops!! Great guide to Portland! We’ve been a few times but haven’t touched on many of the places and spaces you’ve mentioned. Though Powell’s and PokPok are always top of mind. 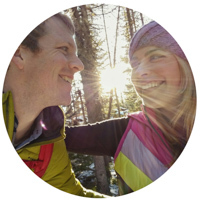 Now we have a perfect excuse to return and do more exploration with your tips – thanks!